This page will give you all the information you need to become a better muskie fisherman. Both veteran and novice anglers will be able to use the information on this page to improve their knowledge and skills at fishing for muskie. We start out by teaching you basic information about muskie, then give you some of the best tips. In addition you’ll get to know the muskie all-time fishing record, facts about muskie and more. Muskie (Esox masquinongy) are a large species of freshwater fish that are native to North America. Muskie is just a nickname for this species of fish, the true name is muskellunge. In the pike family muskie are the largest member and they are actually a very uncommon fish. They are only found in large rivers, mesotrphic lakes and oligotrophic lakes in North America. Muskie will hunt and feed on prey that is up to 30% of its body length and this can include fish crayfish, frogs, ducklings, muskrats, mice snakes and other small birds or mammals. In the spring months they generally hunt small prey while in the fall they will hunt larger prey to prepare for the winter months. 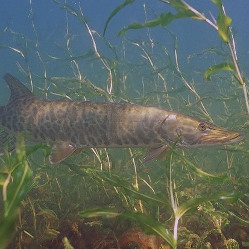 Muskie prefer a clear water habitat that has rock outcrops, weeds and other structures that they can rest and hunt pretty from. They like shallow water that has heavy weed cover and in steams or rivers they prefer rocky shorelines. 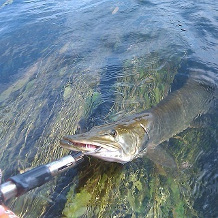 It’s a very rare occurrence to catch a muskie at a depth greater than 40 feet. When they spawn they prefer the water temperature to be between 50 and 60 degrees. Spawning takes place on gravel areas at a depth of about six feet. Muskie can be easily identified by their light brown color that is barred or spotted and they look very similar to grass pickerels and red fins. Below are the tips we feel comfortable exposing anglers to and the ones that we consider to be effective. They’ve been proven in the field and can help you catch more muskie. Know the Body of Water – Before you go fishing you should obtain a map of the body of water where you plan to fish for muskie. The map will have useful depth indicators and contour lines. This will help you find the best spots to hunt for muskie and save your arms from casting over and over to find the right spot(s). Go Barbless – A good safety tip when fishing for muskie is to use hooks that are barbless. This will make it much easier to remove the hook and unlike what other anglers might say it doesn’t reduce hook sets. We recommend using the Gamakatsu barbless hooks. Downsize in the Spring Months – When the water is cool you’ll want to use a smaller size lure and bait. Remember that during the spring months they go after smaller prey and increase their prey size in the fall months. The general idea is to increase the size as the season wears on. But regardless of season, you can never go wrong by using the Mini King Spinnerbait. The Right Setup – You’ll want to have a 7 to 8 foot heavy duty fishing pole with a 20 to 25 pound fishing line. You’ll also need a leader wire that is 75 to 100 pound test. You simply can’t go for the monsters without the right equipment. The leader wire in particular is often overlooked. Buy a quality, reliable brand such as the AFW Tooth Proof Leader Wire. Frogs or Minnows – If you’re going to fish for muskie with live bait then we recommend that you use either extra-large minnows (5″ to 8″) or juvenile bull frogs. They work very well and are a standard staple in the muskie diet. Fishing is a great sport, but nothing is more exciting then becoming a world record holder for fishing. Who knows, maybe in the future you could hold the next muskie world record. For now, you can view below what you need to aim for to become the next record holder. This information is obtained from the IGFA (International Game Fish Association), the largest and most respected source for world fishing records. Do you want the basic facts and stats on muskie? If so then the section below is perfect for you. We’ve put together the more important facts and stats on muskie. It’s important to point out that some of the information below is based on averages and may not represent the upper bell curve of the muskie population. If you notice anything invalid or outdated then please let us know. You’ve reached the end of the road and we hope this section was successful at teaching you about muskie and how to catch more muskie. If you’d like to continue your research or find more useful muskie fish information then we recommend the following resources. Pro Tactics: Muskie – This is a must-read book for those who want to catch bigger muskie with more frequency. The book is written by two professionals who will teach you everything you need to know. Muskie Hunter Forum – An excellent community for anglers who love to fish for muskie and who want to engage and discuss with other anglers fishing tips and stories related to muskie.